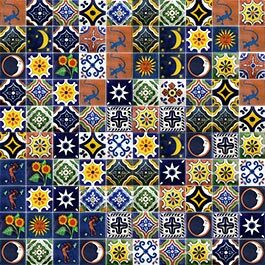 So, we've decided on Mexican handmade tiles and we'd like to experiment with a uniquely random tile design. Hmmmmm !! - Not so easy !! Random handmade tile patterns are very compelling. There is something about disorder and asymmetry that is very inviting and appealing to the eye. All sense of order is removed and the final result draws you in as the brain naturally tries to make sense of the image geometry. The problem is that one naturally veers towards repeating combinations when designing tile patterns and true randomness is difficult to achieve. Our new Random Tile Pattern Designer application helps you to design a truly random, non-repeating tile pattern. Just measure your wall height and width in centimeters, enter the measurements below and click on "open my random wall". The new window will show your empty wall and the 10cm handmade tiles currently available. Choose which tiles you'd like to include in the pattern and click the "randomise" button as many times as you like to generate a different random pattern each time. A randomiser for handmade tiles. Enter your measurements here and we'll open a new window for you where you can create a random tile design using your choice of handmade tiles. Click on the 'open my random wall' button and we'll open a new grid in a separate window - just for you !! We believe that randomness is an underrated quality in current design. For a truly compelling effect which is virtually impossible to ignore there is nothing quite like a random combination of a limited set of tiles. You can order your design directly from this page or use it as a rough template for something more regular by visiting the Tile Wall Designer. We do recommend that you print your design so that you remember the combination.